Fred Ross was born in Saint John, NB, on 12 May 1927. His contributions to New Brunswick’s art community spanned more than sixty-five years and he was one of the province’s most recognized and influential painters. Some of his formative art training took place under Violet Amy Gillett (1898-1996) and Ted Campbell (1904-1985) at the Saint John Vocational School in the mid-1940s. After completing two major mural projects, Ross was able to travel to Mexico to view the work of other muralists. Unable to obtain significant commissions for large-scale works, he turned to the work of Renaissance masters for inspiration and in 1953 travelled to Italy to study their work. Upon his return he taught in the art department of Saint John Vocational school until 1970 when he retired to paint full time. Throughout his career, Ross’ working method included an extensive review of the continuum of artistic developments as source material for his own work. To that end he developed and maintained an extensive research and comparative library of reference material. Fred Ross died in Saint John on 19 August 2014. A significant component of Ross’ figurative work in the 1960s and 1970s explored the relationship among artist, subject and viewer and his work showed an affinity with Balthus [Balthasar Klossowski] (1908-2001) a French-born painter of Polish descent who worked primarily in Switzerland and who was one of the most important figurative painters of the twentieth century. 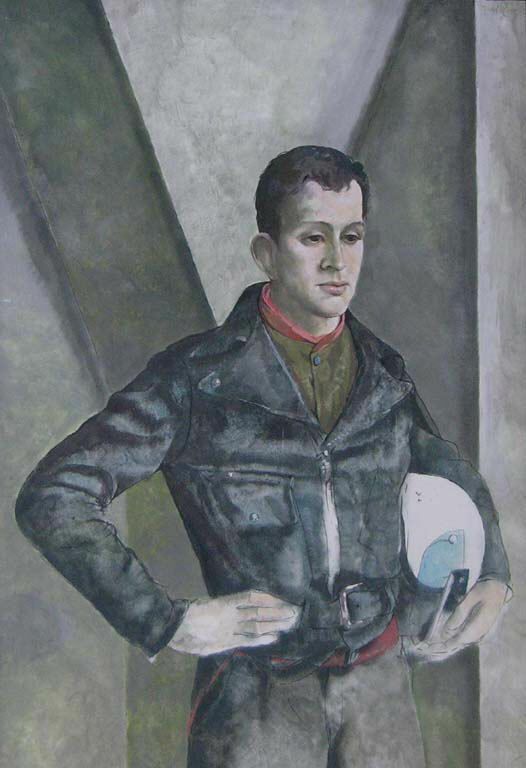 In Ross’ 1965 painting, Boy with White Helmet, a handsome and confident motorcyclist in a black leather jacket evokes all the swagger associated with the coming of age of the post-WWII generation. 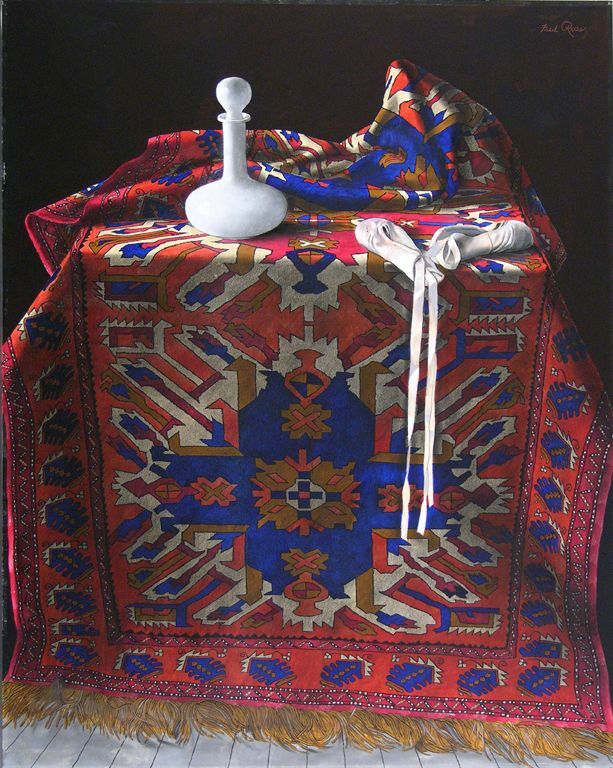 In the 1980s, Ross concentrated his efforts on the still-life making use of objects to symbolize the figure. Bathed in a soft and clear light, Fred Ross’ painting, Still Life with Pointe Shoes, is filled with allusions. There is a complex language superimposed on the obvious representation of objects in this image. These items can be interpreted as representations of masculinity and femininity or they may even refer to particular individuals. Ross’s fascination with the exotic patterning of the rug is contrasted with the three-dimensional volume and coldness of the decanter and the soft smoothness of the pointe shoes. With a minimum of colour, tone and form, Ross has conjured a masterful work that is filled with charm, mystery and timelessness.